Located to the south and adjacent to the Grand Palace, Wat Pho is home to the biggest reclining Buddha in Thailand. This massive 15 metre high and 43 metre long image of the reclining Buddha, decorated with mother-of-pearl inlay at its soles, is enshrined in this oldest and biggest temple in Bangkok that is often referred to as “The Temple of the Reclining Buddha”. The 8 hectare temple compound is also the national headquarters for Thai medicine and is known as the birthplace of Thai massage. This famous Thai massage school has two massage pavilions located within the temple area and additional rooms in the training facility outside the temple. Wat Pho boasts not only the largest reclining Buddha, but also Thailand’s largest collection of Buddha statues. Official Temple name is: Wat Phra Chetuphon Vimolmangklararm Rajwaramahaviharn. Wat Pho, is an abbreviation of the temples older name Wat Photaram. 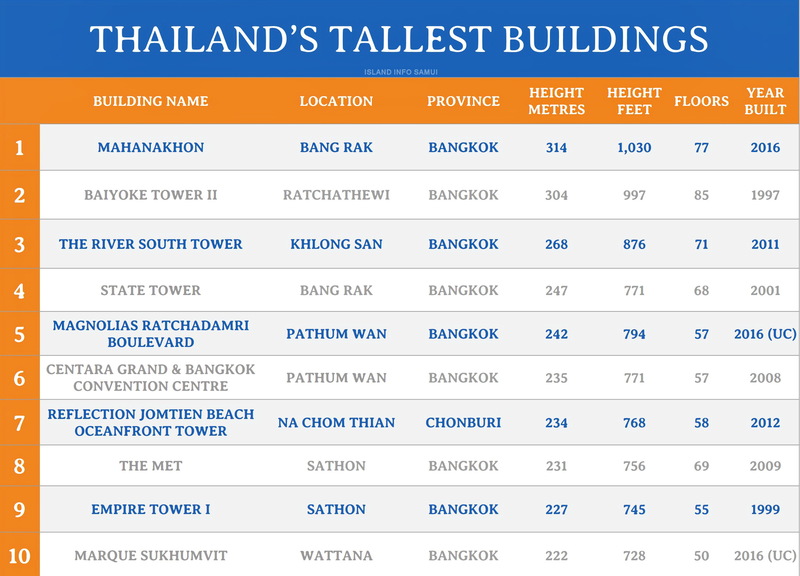 Below is the latest list of the tallest buildings in Thailand. The new tallest building in Thailand, MahaNakhon, located next to BTS Chongnonsi, was completed and opened in May, 2016. Keep up to date with all of the current, under construction and proposed Thailand buildings here. The Great Buddha of Thailand, the tallest Buddha statue in Thailand, and ninth highest statue in the world, is located 140 kilometres north of Bangkok in the Wat Muang Monastery in Ang Thong province. This imposing statue stands 92 metres high and 63 metres wide. Construction commenced in 1990, and was opened to the public in 2008. The Buddha is painted gold and made of concrete. The Great Buddha is also known as The Big Buddha, The Big Buddha of Thailand, Phra Buddha Maha Nawamin, and Mahaminh Sakayamunee Visejchaicharn. Wang Saen Suk or Hell Garden is also located inside the grounds of Wat Muang. This is without doubt, the strangest collection of Buddhist statues in Thailand. Only drink bottled or boiled water. Tap water is usually ok for brushing teeth. Ice from any retail establishment is safe to consume. Light, cool clothes are highly recommended for those coming from cooler climates. Thin cotton or other “breathable” material is recommended. A light jacket or sweater may be necessary in the cool season, especially when you are in a mountainous area in the North or North-east.